Play had to be stopped for two minutes. 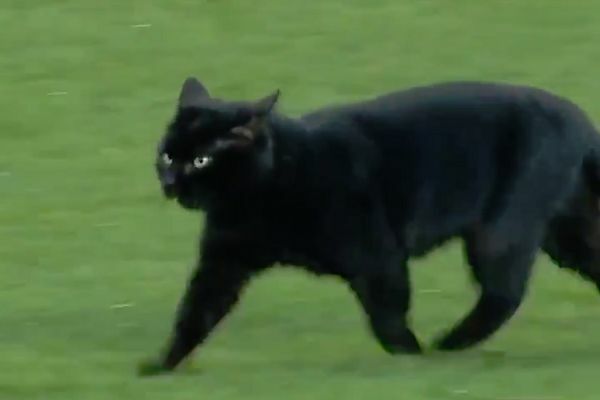 A black cat interrupted Everton’s 1-3 defeat to Wolves at Goodison Park on Saturday when it appeared on the pitch midway through the second half. The Premier League clash was paused for over two minutes while the animal was pretty much left to its own devices as it wandered around on the grass. Everton manager Marco Silva has been coming under increasing pressure from supporters in recent weeks. And the commentators speculated that “Tiddles” had been smuggled into the stadium by a mischievous home fan. Despite a suggestion that someone should “embarrass themselves”, in the end the cat only needed a little guidance to make its way off the pitch and out of harm’s way. The game continued but no further goals were scored following the intrusion in the 68th minute.